The pageant introduction is often the first impression the judges and the audience receive from the contestant. It’s vital that this introduction is authentic and also consistent with who the contestant truly is, and, it can’t hurt if it’s also intelligent, entertaining, and educational. That can be a lot to cram into 30 seconds. 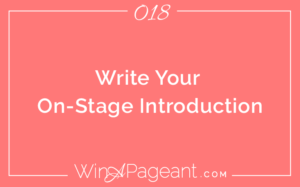 In this episode, I’ll walk you through an easy process to come up with your engaging on-stage introduction. The full process I use with my clients is to first discover your greatest accolades (an accolade is an accomplishment or honor you’ve received) in each area of the wheel of life…I’ll explain that a bit later. Then, we choose the ones that are the most important to you and would have the most impact on the audience. Finally, we find the common element of each of these – I call it the thread – and we find a unique, fun, educational, or funny way to tie them all together. When you’re ready to sit down and create your introduction, I recommend downloading the guidesheet to help you through this process. You can get it now for FREE here: Download Free Guidesheet. The first step is to discover your greatest accolade in every area of the wheel of life. The wheel of life is a concept commonly used in psychology and personal development. It is essentially a circle cut into pie pieces with each equal piece representing a different area of life, like Family, School, Career, Personal Development, Spirituality. Go through each area of life and write only 1 awesome thing you’ve accomplished in that category. If two come up, write them both, but choose the one you are most proud of or that would be the most impressive to others. For example, in the career area, you may mention the internship you got at a highly respected management consulting firm. For school you may mention that you were valedictorian. For personal development you may mention that you can solve a rubrics cube (I can! My brother taught me several years ago – that’s a great party trick!) For spirituality, you may say you first heard God’s voice stand out from other forms of intuition after a 3-day fast (that’s another one I can proudly claim). There are a few other areas like Health, Fitness, Finance, so be sure you get the guide online. The second step is to choose the top 5 accolades – these could be the most impressive, the most unique, the most important to you. Don’t over-think this part, you can always interchange them later. The third step is to analyze these 5 accolades and discover a common thread that runs through each of them. Maybe each of these accolades proves your commitment to helping others. Or, they are all examples of you thinking outside of the box. Maybe you have overcome challenges in every area. You must dig until you come up with at least one common thread. Usually, my clients and I are able to come up with at least 2, sometimes up to 4 very obvious commonalities of the top accolades. The fourth step is to create a brief paragraph mentioning each accolade by highlighting the common thread. This is the secret sauce. This gives your introduction a theme that can be remembered even when all the other introductions and faces get all jumbled up in a judges’ mind. This step will take any old introduction and turn it into something memorable. And, if delivered with zest, this can make or break your first impression. You have to get creative here. Usually, I write a phrase or sentence for each accolade and then put a cute beginning and ending to the paragraph and weave the mandatory components (like name, age, hometown) in at the end. After you’ve crafted the initial draft, the fifth step is to trim out the connecting statements and repetition or any unimpressive or unrelated accolades. This is the part that you’ll practice reading the statement to be sure it meets the time limitations. Finally, you’ll practice HOW you say the statement to infuse your personality and make it more engaging and entertaining to listen to. Always rehearse with 10-times more energy than the normal human interaction. On a big stage with bright lights, everything has to be over-done to communicate your energy. Theater participants are great at this. If you find this difficult, it would be great to join the drama club or take an acting or improve class to learn some basics. Now, you have a perfectly timed, entertaining, and memorable introduction. I recommend choreographing some introductions, especially for small children, because it can help them to communicate the emotional inflection of their words, plus, it’ll help you remember what you mean to say. Don’t over-do this, but a few gestures at the start of each phrase could be useful. That, ladies, is how you win a pageant. Check out my new course, the “Pageant Interview Game Plan” for this guidesheet and my sought-after interview strategy training. Click HERE to learn more.